This entry was posted in Uncategorized on March 16, 2019 by Sheila Peacock. how the Council will deliver its commitments on climate change without funding for a full-time equivalent Climate Change Officer? The post was until recently held by two job-sharers, but one has left and not been replaced. Full text of our query is here. Councillor Hayley Eachus, portfolio holder for the environment, responded saying that climate change was embedded in the roles of many council officers, and that on our specific point about recycling, the waste disposal contractor had been working with the Council to increase recycling rates. We used the right of reply to ask specifically about Manydown, to which she responded in the same vein, that it was embedded in the Council’s interactions with the contractor. This entry was posted in Uncategorized on March 2, 2019 by Sheila Peacock. The main message is – look out for a government consultation on this in 2019. I ask myself – will action on its conclusions be in time for Manydown? And will the final word, “affordable”, have unintended consequences? This entry was posted in Uncategorized on December 15, 2018 by Sheila Peacock. Link to ministerial response received 13/11/2018 via Kit Malthouse MP. This entry was posted in Uncategorized on November 30, 2018 by Sheila Peacock. (if you think this isn’t good enough, write to your MP). 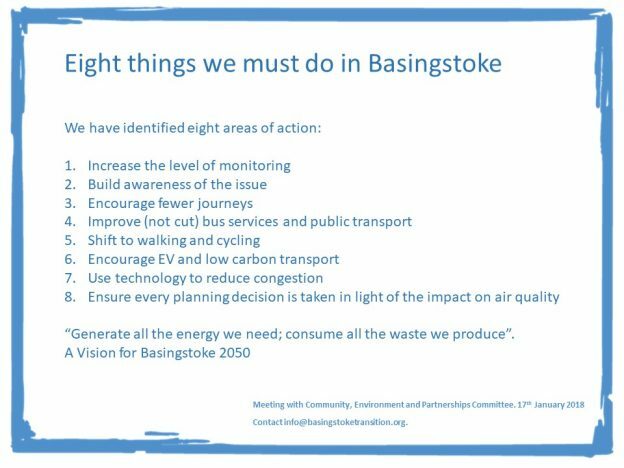 The shock news that the Council is withdrawing the mixed-plastic recycling bins from Basingstoke triggered us to launch a petition, which you can sign at: Change.org . We presented the 700-odd signatures we’d got by then to yesterday’s (Thurs 18th October) full Council meeting, from which they will go to the environment portfolio-holder in the Council cabinet. Our petition calls for the development of a recycling strategy for the Borough, since its recycling record of 26% is abysmal. This entry was posted in Uncategorized on October 19, 2018 by Sheila Peacock.